Before you make any big decisions or sign any contracts, you’ll likely need to establish power of attorney between you and your deployed spouse. Essentially, giving someone power of attorney allows them to sign legal documents on your behalf. This is obviously critical for military members who are overseas and can’t sign things in person. By taking on power of attorney for your spouse, you can be ready to sign on the dotted line as soon as necessary to make sure you don’t miss out on the home you want. Once you’ve established power of attorney, you can then begin your house search in full force. Sign up with Homes for Heroes and we’ll match you with a local real estate specialist who can help you find your dream home. We’ll also connect you with one of our mortgage specialists who can help guide you through the intricacies of the homebuying process. Our lending partners are intimately familiar with VA loans and take great pride in helping military families achieve their goals. Technology has made buying a home easier than ever by improving nearly every part of the process. Use technology to your advantage, particularly when it comes to involving your deployed spouse in the house hunt. Sure, most listings include pictures online, but it can be difficult to get a true sense of space, not to mention the neighborhood, from a few still images alone. To help keep your spouse up-to-date when touring homes, send your own pictures and video using WhatsApp or Facebook. Real estate agents are also increasingly offering virtual tours of their properties, which can be a great way to explore a home from a distance. Technology can also be useful for the more technical aspects of the homebuying process. Ask your lender or real estate agent if you can stream or record your meetings so your spouse can have all the information you do. Also, ask if your real estate professional offers electronic documents or signatures. Even if you’ve established power of attorney, digital signatures can make it easy to sign contracts or other documents from overseas. Perhaps the best thing you can do to improve your homebuying experience is to save money on the purchase. After all, wouldn’t you love to tell your spouse how much you saved while they were deployed? By working with Homes for Heroes, military families can save on their real estate transaction, lending fees, title fees, home inspection fees and more. The average military family saves an average of $2,400. That can buy quite the welcome home present. Deployments are challenging enough; the homebuying process shouldn’t add to it. Homes for Heroes aims to be a supportive resource for all military families going through the homebuying process. It’s our way of saying thank you for the sacrifice all active military, veterans and their families make in service to our country. 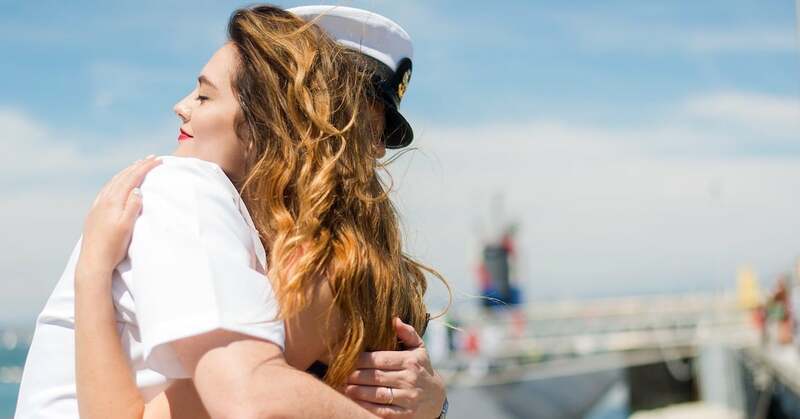 Want your deployed spouse to return to a new house? Sign up today and let us help you navigate the homebuying process and save you money along the way. Given any number of potential challenges in communication, it’s also a good idea to make major housing decisions before the deployment occurs. This could cover everything from commuting distance to post, style of home, lots size and shape and lots more. Discussing these things in advance, recording/taping or writing down needs and wants (and working out compromises beforehand) can smooth the process. It is also likely a good idea to spend time visiting open houses and researching neighborhoods and more to develop a sense of what you like versus what’s available in the market. The more that can be decided in advance, the easier the process for your spouse. Thank you for adding some great points, Keith!